In a speech on climate change at Yale University’s School of Forestry & Environmental Studies, the Secretary of the U.S. Department of Agriculture (USDA), Tom Vilsack, defended the intensive confinement of farm animals on the grounds of demand, saying “the market has been encouraging [farmers] to do that.” He also stated unequivocally that abuse on factory farms is the exception, not the norm, in spite of the fact that confinement is, in and of itself, abusive and that animal mutilation is standard practice on industrialized farms. 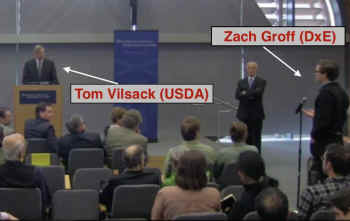 After Mr. Vilsack addressed Mr. Groff’s remarks, categorically denying the inherent cruelty of animal agriculture, DxE activists disrupted the event, chanting “It’s not food. It’s violence” as they exited the auditorium. DxE is growing rapidly. In the 1.5 years since launching the “It’s not food. It’s violence” campaign, the organization has added chapters in 110 cities in 24 countries, including India, Bolivia, Romania, Indonesia and the Republic of Georgia. Following is short video highlighting their recent non-violent direct actions. Please visit Direct Action Everywhere to learn about, support and/or join the organization’s ground-breaking campaign to expose animal cruelty in the very spots where it is taking place.